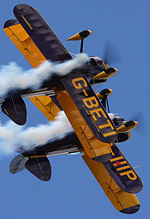 Sywell's biannual airshow is fast becoming an unmissable event on the airshow calendar. This year's show held much promise with Avro Vulcan XH558 booked to perform a full display. 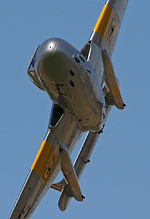 Once again the show would be supporting the very worthy cause of Warwickshire and Northamptonshire Air Ambulance. Russell Collins reports from sunny Northamptonshire. Trev Collins, Dan O'Hagan and Huw Hopkins provide additional photos. There aren't many more picturesque airshow venues in the UK than Sywell aerodrome in Northamptonshire. Luckily a severe weather warning issued for the south of the country stayed clear of Sywell, with the airfield basking in brilliant sunshine for most of the day. For the first time, the airshow benefited from Sywell's new 4,160ft concrete runway, which was completed in the summer of 2009. This allowed the likes of the Vampire Preservation Groups De Havilland Vampire T11 and Air Atlantique's DC-3 to operate from the airfield, it was believed to be the first time a Vampire had operated from Sywell since the 1950's. The show kicked off promptly at 14:00, with few breaks in the flying throughout the whole display - something that is often rare at so many UK airshows. Perhaps the main attraction of the show is the sheer closeness the crowd gets to the action, with many of the aircraft using one of the grass runways adjacent to the crowd line to takeoff and land, taxiing only a few feet away. Additionally the aircraft display line is significantly closer to the crowd line than at many other shows; it's comparable to Old Warden in that respect. The Pitts duo opened the show, with some lovely formation aerobatics, with both aircraft using a smoke system which does make such a difference. The wonderful Great War Display Team soon followed, putting on a fine show benefiting from the small display line. A whine of a Rolls Royce Goblin engine firing up indicated the only classic jet at the show was to soon grace the skies with the distinctive shape of VPG's Vampire T11, flown by Mark Hooton. 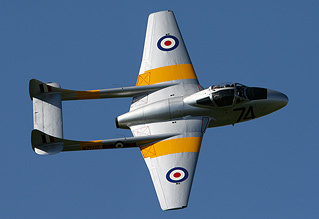 The display seems to get better and better with every showing, with the crowd being treated to a number of superb topside passes from the Vampire, before the aircraft recovered back on Sywell's runway. 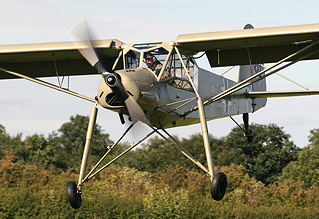 Displaying for the first time at Sywell since its recent restoration was Peter Holloway's Fieseler Storch, which is based at Old Warden. The Storch gave a splendid display, demonstrating the aircrafts remarkable STOL capabilities. You can appreciate how this aircraft type was instrumental in the Nazi's rescue of Benito Mussolini from capture, in the Apennine Mountains during 1943. Captain Neville's Flying Circus performed a certainly different and unique routine, firstly the aircraft attempted to pop balloons with their rotors, secondly they had a penalty shoot out with the pilots swooping in to drop footballs at a goal and goalkeeper (who was rubbish by the way). Lastly, they demonstrated their astute piloting skills, by flying under not one, but two ropes. 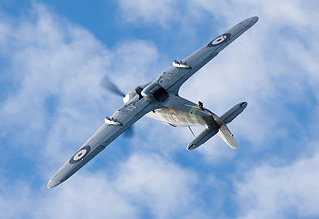 Warbird fans were treated to performances by the Grace Spitfire, Peter Teichman flying his Hurribomber and Maurice Hammond's P-51D Mustang "Janie". The Battle of Britain Memorial Flight Avro Lancaster was also performed later in the day and for a final pass treated the crowd to a seldom seen topside pass, before turning north to RAF Coninsgby. 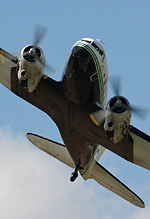 Coventry based Air Atlantique's DC-3 and Avro Anson, started their respective displays in formation before both performed their individual routines. Hawker duo, the Hind and Nimrod also similarly started in formation. A regular display at Sywell is Skytech's Hughes 500, which rarely seems to display anywhere else. The highlight of this routine is the traffic cone finale. The pilot knocked over the cone with one of the helicopters skids, before picking it up with the skid and flying off with it, to an innocent bystander, it could - may - look like traffic cone theft, but it's not. Placing the cone back on the floor the cone was then stood back up using the skid. A demonstration of precise and extremely skilful flying, that was cone but not forgotten. Unsurprisingly the home team, the Blades, lead by Myles Garland, put on a marvellous display that we've become accustom to from the team since they were formed at Sywell in 2006. Towards the end of the flying display, we saw the welcome sight of the Breitling Wing Walkers. For many the real highlight of the flying display would have been Avro Vulcan XH558, which was scheduled to close the show at around 17:45 with its full routine. Unfortunately, due to the severe weather in the south of the country, the aircraft's appearance was cancelled. The Vulcan was taxiing for takeoff at Hurn airport, when ATC told the crew to knock it off, because of the increasingly poor weather. News of the cancellation first appeared on XH558s official Twitter page around 17:00, but the commentary team did not mention it's cancellation until some time after this, leading to inevitable criticism after the show. XH558 was also booked to do a flyby at the last show at Sywell in 2008; sadly a technical problem at the time also curtailed its appearance. It seems the organisers don't have much luck with getting the Vulcan at Sywell, so let's hope its third time lucky next time. The Red Arrows were also scheduled to perform a flyby at the show. Initially, they had requested a flyby around 19:20 at Sywell, this was of course rather pointless as the show would have long been over and the crowd departed. The Red's offered a new flyby time, sadly this was too little too late, as the organisers were unable to reconfigure the display at such short notice to accommodate the Reds. Therefore they cancelled sadly. Certainly, it wasn't just the flying display that should be praised; some of the public amenities also deserve a mention. If you were prepared to walk an extra 100 yards, there were very few queues for the toilets and the speaker system is one of the clearest I've ever heard at an airshow. Upon entering the show ground, stewards were handing out free programmes (how refreshing!) and also for those paying on the gate, tickets were only £15 for adults, which is super value. On the downside, for many there were traffic issues both arriving and departing, however this is understandable with only one exit and crowds on the day. I'm sure for future shows the organisers will address the single public car park issue and also rather poor traffic management, although they were obviously overwhelmed with the numbers in attendance. Remarkably over 10,000 people turned up, smashing previous attendance records. This was more than double the number of people anticipated and over double the number that have attended the Air Show at Sywell in the past - making it the most successful show at Sywell ever. Great news for the show and its future, but more importantly, it should also mean a large cheque winging its way to Warwickshire and Northamptonshire Air Ambulance. Despite the cancellation of the Vulcan and the Red Arrows flyby, the show was a really splendid day out for the whole family. On the evidence of this years show, aviation enthusiasts could only wish that the Sywell airshow was an annual event, sadly this not the case though with the organisers confirming that the show will return in August 2012, start counting down the days!